Congratulations on surviving at least to the last day of 2016! I honor of that, today’s “ringing out the new year” is “Still Alive”, from Portal 1. Enjoy, and Happy New Year’s Eve. This entry was posted in fluffy, YouTube and tagged Fluffy, youtube on December 31, 2016 by Fluffy McGiggles. As mentioned yesterday, a series of carillon videos to ring out (and in) the New Year seemed appropriate. This entry was posted in fluffy, YouTube and tagged Fluffy, youtube on December 30, 2016 by Fluffy McGiggles. From what I understand, “Ringing In (or out) the New Year” is a tradition some follow. In honor of that, TotalFluff will be running a series with a different Carillon (or Bell Tower) YouTube video between now and the beginning of the new year. The first is a playing of the Harry Potter theme. I hope you enjoy and have a good Thursday. This entry was posted in fluffy, YouTube and tagged Fluffy, youtube on December 29, 2016 by Fluffy McGiggles. Where do they get the electricity? 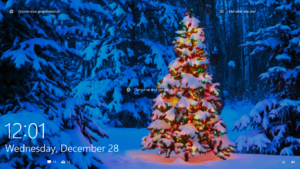 I recently encountered an image that has been used by Microsoft as a background for log-in pages. It is quite lovely. However, I do have to ask… where is the electricity for the tree coming from? And on that unnatural note, I leave you with a wish for a lovely Wednesday. This entry was posted in fluffy and tagged Fluffy on December 28, 2016 by Fluffy McGiggles. So, some of you may be aware of the movie “Assassin’s Creed” that came out a bit ago. It’s (apparently) based on a video game franchise I haven’t played. It may be interesting. I don’t know. But in honor of that, I’m sharing with you the “Literal Trailer” for the trailer for the first game of the franchise! It’s another of my favorites, so I hope you enjoy! This entry was posted in Webmaster, YouTube and tagged webmaster, youtube on December 27, 2016 by Webmaster. One of the features of the prank present is that it’s ridiculous to open. So, I’d originally planned in basically wrapping the thing in tape. I couldn’t find that much tape, though, so I ended up sewing it shut. Yes, it was easier for me to find a needle and thread and to sew crepe paper shut, than to find more tape. Again, Merry Christmas! I hope you have a great one. This entry was posted in Christmas, Holidays, real world, Webmaster and tagged Christmas, holidays, real world, webmaster on December 25, 2016 by Webmaster. So, here’s a friendly reminder that the “Christmas Can-Can” exists. This entry was posted in Christmas, Holidays, Webmaster and tagged Christmas, holidays, webmaster on December 24, 2016 by Webmaster. So, tonight’s my family’s annual Christmas Caroling Party. In honor of that, I thought I’d share a fantastic arrangement of the “Wassail Song”. It’s gorgeous. Also, fun fact. It turns out that “Wassail” doesn’t just mean “hot cider”. It does, in fact, mean “caroling” at this point. I thought the connection between the two definitions was kinda funny. You can basically understand the whole history of that word. First, you have Wassail as the alcoholic warm cider. Then you have people going around town singing drunkenly. Since Cider is especially a Christmas-y drink, the singers (or those going “Wassailing”) would probably primarily try for Christmas Carols. Hence, “Wassailing” now also meaning Christmas Caroling. So, yep. Have a lovely Friday! This entry was posted in Christmas, music, Webmaster and tagged Christmas, music, webmaster on December 23, 2016 by Webmaster. As some of you may know, Winter Solstice was yesterday. And the Steam Winter Sale supposedly starts sometime today. So, HAPPY WINTER!! I personally think it’s one of the *coolest* seasons. In honor of the season, I’m going to share a song that Fluffy shared last year: “Blow, Blow thou winter wind.” It’s lovely, and seasonal. So, yep! I hope you have a lovely Winter! This entry was posted in real world, Webmaster and tagged real world, webmaster on December 22, 2016 by Webmaster.